Oh my goodness, where do I even begin? My weight loss struggle has been life long. Or at least from my teen years on. To make it easy to understand, here is a little timeline of my struggle………..
80′s/90′s: Began gaining weight in Junior High. Continued with my weight struggle through High School even though I was an athlete. I had also been diagnosed with IBS due to chronic stomach issues. 1993: I began to lose weight the summer before college. Do you remember the Fat Free craze? I went on this diet full throttle! I lost 60 lbs. by my first semester of college. I tried out and made the dance team and successfully kept the weight off by starving myself, dancing and working out for about 4 hours a day. I looked sick at times and even battled anorexia. Not the best long term plan for my metabolism. 1999: I begin to slowly put on weight because I was only working out about an hour a day instead of 4. In one month I managed to gain 35 lbs!!!! Talk about panic! I went to the doctor and they told me although my thryoid was boderline abnormal, it didn’t warrant medication. I was additionally diagnosed with ulcertive colitis due to increasing issues with my stomach. 2000: I begin planning my wedding and go into full on panic mode on how to get the weight off that was continuing to pour on. Months before my wedding I begin the Cabbage Soup Diet. I proceed to run to the bathroom for 2 months straight as my stomach explodes and pray that I don’t have an accident in my wedding dress, Bridesmaids style. But hey, some of the weight was coming off. Great plan, right?! Jan. 2001: Leave for my wedding the U.S. Virgin Islands thrilled to be fitting in my wedding dress. Go off cabbage soup diet for my honeymoon and return home 7 days later, 17 pounds heavier!!! May 2001: We are having a baby!!! Due December 2001, I gain 60 lbs! December 2001: Deliver 8lb. 7 oz baby and come home 15 pounds heavier then when I went in. January 2002: Celebrate our 1 year wedding anniversary while wearing maternity pants (I’m no longer pregnant) and crying. Run into old high school friend while out for dinner and want to hide under table. December 2002: We are having another baby!! Repeat weight gain……..
August 2003: A Deliver 8 lb. baby, gain 10 lbs. in hospital. Start thinking these celebrities are either lying or getting the fat and water sucked out of them in the hospital! May 2005: Baby #3 on the way! Did I mention I haven’t lost the weight from the other 2?! Started to get absolutely exhausted, desperate and depressed. Develop Hyperemisis and throw up 24 hours a day for 9 months. Still manage to gain about 35 lbs. January 2006: Baby #3 weighing in at 9lbs. 14 oz!!! Gain even more weight before I come home. If you are keeping track, that would be 3 babies in 4 years!!! Two weeks later, our middle son is diagnosed with Autism. I spend the next 6 years focusing any extra energy I can find on helping him improve and heal. July 2006: Decide to join Weight Watchers. I lose 40 lbs. by May 2007. Then suddenly gain 5lbs. in one week. Freak out at Weight Watchers meeting and never go back. Gain back 50 lbs. October 2006: Find out son is allergic to Gluten. Start reading the signs/symptoms and realize my life long severe stomach issues may be a Gluten Allergy. Get tested and sure enough, gluten allergy. Go off Gluten and my stomach pains and GI upset go away within 7 days. Think I should now lose weight because of this discovery. NOPE. Find out that so much damage is done to my gut/intestines that my body doesn’t know how to properly digest food. Gain more weight. June 2011: Join gym. Can’t take it anymore, must lose weight and find some energy!! Work out every. single. day in the summer. Gain 20 lbs. August 2011: Husband (who is a doctor but can’t run tests on me) sends me to several doctors. All say my tests are boderline normal and maybe I should consider Gastric Bypass. Start crying so hard in one doctor’s office he asks me to use the back door to leave so the other patients don’t see me so upset (not even joking!!). March 2012: Finally find an OB/GYN that will listen to me and agrees to do Salivary Testing to try and find an answer. The results come back……………..I have some SERIOUS issues! Hormones are almost non-existent, Adrenal Glands are not functioning (they put me at stage 4 adrenal failure), Cortisol levels are no where near normal (this explains why I wake up 6 times a night), Metabolism is not functioning, my immune system is destroyed and my entire body is in massive inflamation. Oh, and in addition to being allergic to Gluten, I’m also allergic to eggs and dairy. Awesome! Go on bio-identical hormones and Adrenal support. Start to feel a tiny bit better over the next 3 months. April 2012: Decide to go Vegan, can’t eat most of the other foods anyway. Stomach feels amazing on this diet! Slowly start to lose. 1/4 lb. per week. Takes me an entire year to lose 12 lbs. Still exhausted and feeling overwhelmed. June 2013: My nutritionist approaches me about a new supplement called Plexus Slimthat she is seeing amazing results with. I start looking into it. All natural ingredients, no major diet changes, easy to use. I have my Dr. hubby look at all the ingredients and make sure it is safe. He tells me to go for it. The pictures that I’m about to post are from June 2013. 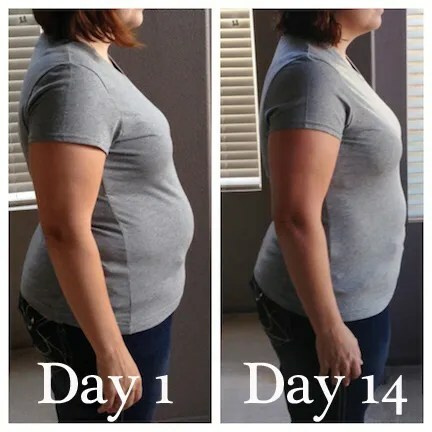 Day 1 and Day 13/14. If these weren’t my own pictures, I honestly wouldn’t even believe it! 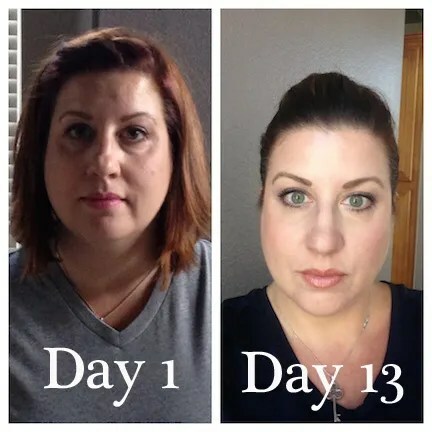 This is my face Day 1 and Day 13. Plexus has a natural anti-inflammatory as one of the ingredients. I believe this is what helped my face to go down so quickly. Regardless of the weight loss, I feel like a new person. I almost feel like I have woken up from a coma. I have energy coming out of my ears!! My kids and husband have noticed a HUGE change in my mood and energy levels. Could this finally be the answer I have been searching for?! Stay tuned to find out as I post each step of my Weight Loss Journey!!! !